The gene-editing specialist has been a rare bright spot within the hard-hit biotech space this year. Here's why. Despite a marketwide downturn that's hit biotech particularly hard this year, Crispr Therapeutics (NASDAQ:CRSP), a mid-cap gene-editing company, has seen its shares gain a healthy 65% over the course of 2018. Crispr's shares have even outpaced fellow CRISPR developers Editas Medicine, Inc. (NASDAQ:EDIT)and Intellia Therapeutics, Inc. (NASDAQ:NTLA) by a wide margin. CRSP price change so far in 2018. Data source: YCharts. What's the secret to Crispr's success? While Editas and Intellia have both struggled to shake off the market's pessimism toward biotech in general, Crispr has managed to swim upstream thanks to its ability to convince regulators in both the European Union and the United States to green light its lead clinical candidate, CTX001, for human trials. Earlier this year, Crispr became the first company to initiate human trials for a CRISPR/Cas9 based therapy of any kind; giving it a key first-mover advantage over Editas and Intellia in the process. Apart from the fact that CRISPR could turn out to be a far cheaper and more user-friendly gene-editing platform than older systems like transcription activator-like effector nuclease (TALEN) and zinc finger nucleases (ZFN), Crispr's first product candidate is targeting some truly big game right off the bat. Crispr and its partner Vertex Pharmaceuticals (NASDAQ:VRTX) are presently evaluating CTX001 in two rare blood disorders, beta-thalassemia and sickle cell disease, respectively. If successful for both of these high-value indications, CTX001 should be able to easily achieve blockbuster status (sales in excess of $1 billion per year) in relatively short order. More broadly, though, CTX001's success in its first round of human trials would go a long way toward validating this groundbreaking approach to gene editing. That's key because Crispr has plans to target a wide variety of human diseases with its CRISPR/Cas9 system, such as cystic fibrosis, various cancers, diabetes, Duchenne's muscular dystrophy, and many others. In short, this clinical-stage biotech could eventually end up generating tens of billions in sales over the next decade. That's the blue-sky scenario at least. The short answer is yes. Unfortunately, the CRISPR/Cas9 system could turn out to have multiple fatal flaws in terms of its use in human therapeutics. After all, recent work has revealed that the CRISPR/Cas9 system may significantly increase the risk of cancer through unwanted off-target effects. This issue may not be a deal breaker for fatal conditions where patients have few other treatment options, but it might significantly dampen the system's ultimate commercial opportunity. Equally as concerning, studies on human cells have shown that a pre-existing immune defense exists against the part of this system that does the heavy lifting in terms of gene editing -- namely Cas9. The issue is that Cas9 is derived from two infectious strains of bacteria, Staphylococcus aureus and Streptococcus pyogenes, that illicit strong immune responses in most humans. As such, there is a real chance that this first iteration of CRISPR/Cas9 will turn out to be ineffective in the vast majority of humans -- or perhaps even illicit life-threatening adverse effects in some patients. Fortunately, researchers believe viable workarounds are indeed possible, but more pre-clinical studies would obviously delay CRISPR's commercial debut. The good news is that Crispr and Vertex should have a much better grip on these outstanding safety issues in the not-so-distant future. The two companies have already started enrolling patients in CTX001's early stage trials for beta-thalassemia and sickle cell disease, after all. So, if any major adverse events pop up, we should know fairly soon. That said, investors probably won't learn much about CTX001's efficacy in either indication for at least another year. Is Crispr's stock worth buying? While Crispr could turn out to be the bargain of the century if everything works out, Crispr and Vertex are at least three to four years away from commercializing CTX001. 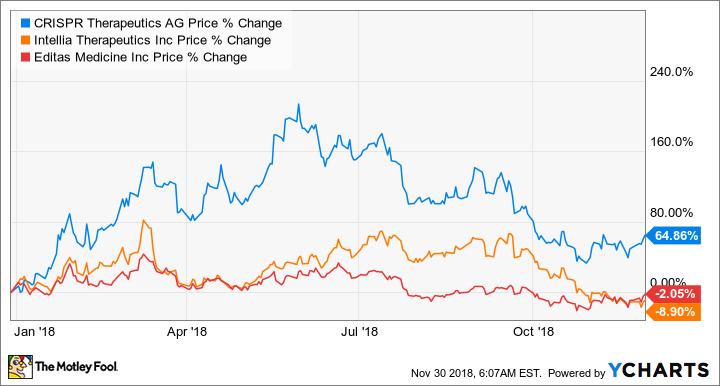 And as extended development timelines tend to act against share price appreciation among pre-revenue biotechs, investors may want to hold off on buying shares of this promising, albeit risky, gene-editing pioneer for the time being.